Habit: Generally shrub; (dioecious). Stem: persisting 1--2 years, rooting at tips and/or nodes or not, erect or arched to mounded or prostrate, 5-angled or not, hairy or glabrous, glaucous or not, stalked glands present or not; bristles or prickles 0--many, prickles stout and wide-based or weak and slender, straight or curved. Leaf: simple, palmately lobed, to palmately compound, leaflets 3 or 5(11), toothed, abaxially +- glabrous to densely hairy; stipules thread-like to ovate or elliptic. Inflorescence: raceme- or panicle-like cyme, axillary or terminal; pedicel bractlets 0. Flower: generally bisexual; hypanthium flat to saucer-shaped, bractlets 0; sepals persistent, reflexed to ascending, ovate or lance-ovate, hairy or glabrous, stalked or sessile glands present or not, tip pointed, prickly or not; petals widely obovate, spoon-shaped, or elliptic, white to +- pink or magenta; stamens generally >> 20, filaments thread- or strap-like; pistils 5--150, receptacle flat or convex to conical, spongy, generally elongated in fruit, ovaries superior, hairy or glabrous, styles long, slender or short, thick, glabrous or hairy; ovules 2, 1 maturing. Fruit: fleshy-coated achenes, aggregate of few to many, yellow, orange, red, or black, generally falling as unit, separating with (blackberry-type) or without (raspberry-type) receptacle attached. Habit: Plant 1--2(3) m, arched to mounded; prickles many, stout, wide-based, straight or generally curved. Stem: 4--10 mm diam, not angled, glabrous, strongly glaucous in youth, persisting 2 years, rooting at tips. Leaf: 1st-yr stem leaves generally compound, leaflets (3)5, terminal ovate to lanceolate, shallow-3-lobed, coarse-toothed, tip acute, abaxially densely white-tomentose; flower stem leaves simple or compound, leaflets 3; stipules <= 1 mm wide, thread-like to linear. Inflorescence: flat-topped cyme, flowers generally 3--10(12). Flower: sepals hairy, prickly, +- with stalked glands; petals 3--5(8) mm, oblong to oblanceolate-elliptic, white; filaments strap-like; pistils generally > 30, styles long, slender, ovaries densely white-hairy. Fruit: raspberry-type, red-purple to +- black. Chromosomes: 2n=14. 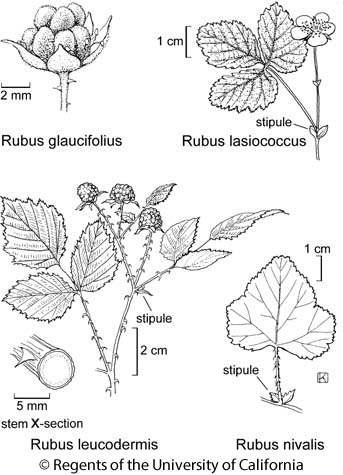 Citation for this treatment: Lawrence A. Alice 2012, Rubus leucodermis, in Jepson Flora Project (eds.) Jepson eFlora, http://ucjeps.berkeley.edu/eflora/eflora_display.php?tid=42027, accessed on April 23, 2019. CA-FP (exc GV); Markers link to CCH specimen records. Yellow markers indicate records that may provide evidence for eFlora range revision or may have georeferencing or identification issues. Purple markers indicate specimens collected from a garden, greenhouse, or other non-wild location.